Pope Clement IX (Latin: Clemens IX; 28 January 1600 – 9 December 1669), born Giulio Rospigliosi, was Pope from 20 June 1667 to his death in 1669. Giulio Rospigliosi was born in 1600 to the Rospigliosi family, a noble family of Pistoia in the Grand Duchy of Tuscany to Giacomo and Caterina Rospigliosi. He studied at the Seminario Romano and later at the University of Pisa as a pupil of the Jesuits. He would receive doctorates in theology, philosophy and both canon and civil law in 1623. After receiving his doctorates, he taught theology there as a professor from 1623 to 1625. Later Rospigliosi worked closely with Pope Urban VIII (1623–1644) where he worked in the diplomatic corps as the Referendary of the Apostolic Signatura. He was appointed as the Titular Archbishop of Tarsus in 1644 and later received episcopal consecration in the Vatican. Rospigliosi also served as the Apostolic Nuncio to Spain from 1644 until 1653 when he decided to retire from that post. He lived in retirement throughout the pontificate of Pope Innocent X who disliked and distanced himself from those associated with his predecessor. He was also made vicar of Santa Maria Maggiore in Rome. Rospigliosi was an accomplished man of letters who wrote poetry, dramas and libretti, as well as what may be the first comic opera, namely his 1637 libretto Chi soffre, speri. He was also a patron of Nicolas Poussin, commissioning A Dance to the Music of Time from him and dictating its iconography. 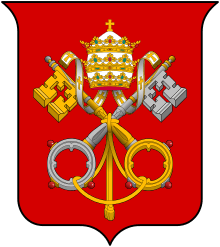 Pope Alexander VII appointed him to the cardinalate in 1657 as the Cardinal-Priest of San Sisto Vecchio and was also appointed as the Cardinal Secretary of State in 1655 which he held until 1667. Pope Alexander VII died in 1667 and a conclave to choose his successor was called. King Louis XIV of France instructed the French faction to turn their support to Rospigliosi and believed also that he would appease the Spanish faction of Charles II due to the fact that he had once been the Apostolic Nuncio to Spain. On 20 June 1667 he was elected as pontiff and took the pontifical name of "Clement IX". 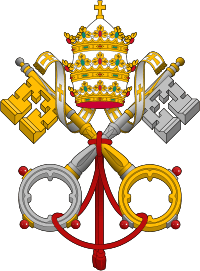 The new pontiff was crowned on 26 June 1667 by the protodeacon, Cardinal Rinaldo d'Este. He later took possession of the Basilica of Saint John Lateran on 3 July 1667. 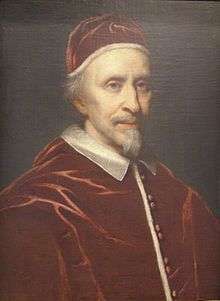 Nothing remarkable occurred under Clement IX's short administration beyond the temporary adjustment of the disputes between the Holy See and those prelates of the Gallican Church who had refused to join in condemning the writings of Jansen. He was mediator during the 1668 peace of Aachen, in the wars of succession between France, Spain, England and the Netherlands. He was popular with the people of Rome, not so much for his erudition and application to business, as for his extreme charity and his affability towards great and small. He increased the goodwill of his subjects by buying off the monopolist who had secured the "macinato", or privilege of selling grain, and as his predecessor had collected the money for the purpose, Clement IX had the decree published in the name of Alexander VII. Two days each week he occupied a confessional in St. Peter's church and heard any one who wished to confess to him. He frequently visited the hospitals, and was lavish in his alms to the poor. In an age of nepotism, he did little or nothing to advance or enrich his family. In his aversion to notoriety, he refused to permit his name to be placed on the buildings erected during his reign. Clement IX confirmed the cultus of Margaret of Savoy on 9 October 1669. He also beatified Rose of Lima on 15 April 1668. On 28 April 1668, he canonized Magdalena de Pazzi and Peter of Alcantara. He elevated 12 new cardinals in three consistories. As pope, Clement IX continued his interest in the arts. He embellished the city of Rome with famous works commissioned to Gian Lorenzo Bernini, including the angels of Ponte Sant'Angelo and the colonnade of Saint Peter's Basilica. Somewhat unusually for Popes of the era, Clement IX did not have his name displayed on monuments he built. He also opened the first public opera house in Rome, and for the Carnival celebrations of 1668, commissioned Antonio Maria Abbatini of the Sistine Chapel Choir to set to music his free Italian translation of a Spanish religious drama La Baltasara. The production had sets designed by Bernini. The tomb of Clement IX. Clement IX worked to strengthen Venetian defences against the Turks on the island of Crete. However, he was unable to get wider support for this cause. At the end of October 1669 Clement IX fell ill after receiving news that the Venetian fortress of Candia in Crete had surrendered to the Turks. Clement IX died in Rome, allegedly of broken heart, on 9 December 1669. His successor, Pope Clement X (r. 1670–1676), built him an ornate tomb in the basilica of Santa Maria Maggiore. ↑ Roger Parker (ed. ): The Oxford illustrated history of opera. Oxford University Press, Oxford 1994, p. 18 f.
↑ Wolfgang Witzenmann: Article “Mazzocchi, Virgilio.” In: Grove Music Online. Oxford Music Online. Oxford University Press, accessed July 6, 2016. Wikimedia Commons has media related to Clemens IX.